How Are the Mobile Services Performed? Our licensed Nail Tech will come to your location equipped with the proper equipment to make your manicure as enjoyable as possible. We do understand the unique circumstances of our clients and this is why we incorporate our Buff-n-Go to service your manicures or we use a portable approved manicure table. If the client is confined to the bed at home or in a hospital setting, we are capable of accommodating the needs of the client and can perform a basic manicure bedside. Pedicures and Toenail Trimmings can be performed with the client lying in bed or sitting upright in a comfortable position. 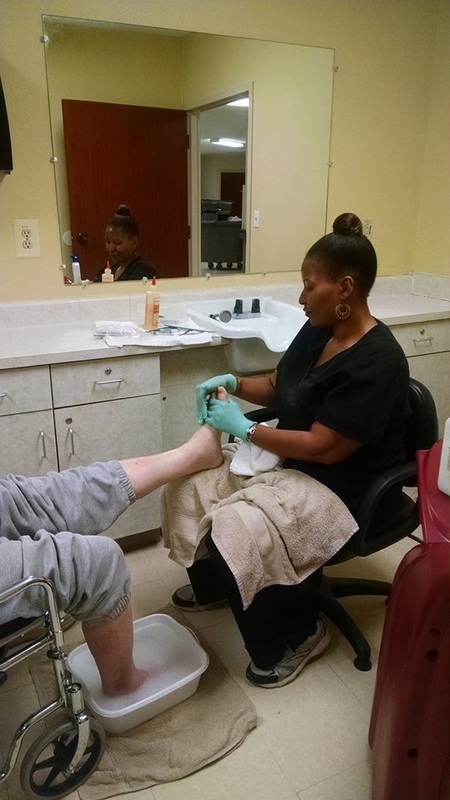 As you can see in this picture; the clients foot is draped onto the lap of the licensed Pedicurist for their service. If the client is bedridden, the feet will be soaked in a foot basin or damp warm towels wrapped around the clients feet to help clean and soften the feet; while the client is laying backside in bed. After the feet are cleaned the Pedicurist will then complete the steps involved for the pedicure. ​​​​This portable workstation is what we use for our travel assignments. It is sturdy and carries all of the essential items that we need to effectively perform a manicure and pedicure service. It's durable and quite spacious as it holds our sanitizing solutions, towels, implements, cremes & lotions.